Hello everyone, sorry for our recent absence, but we’re back, and with embroidery! It’s getting hot, well, as hot as San Diego can get, so we are seeking refuge to try and keep ourselves cool. Whether that’s a visit to the beach, staying inside the air conditioned walls of your home/museum/movie theater, or getting some good old fashioned ice cream. 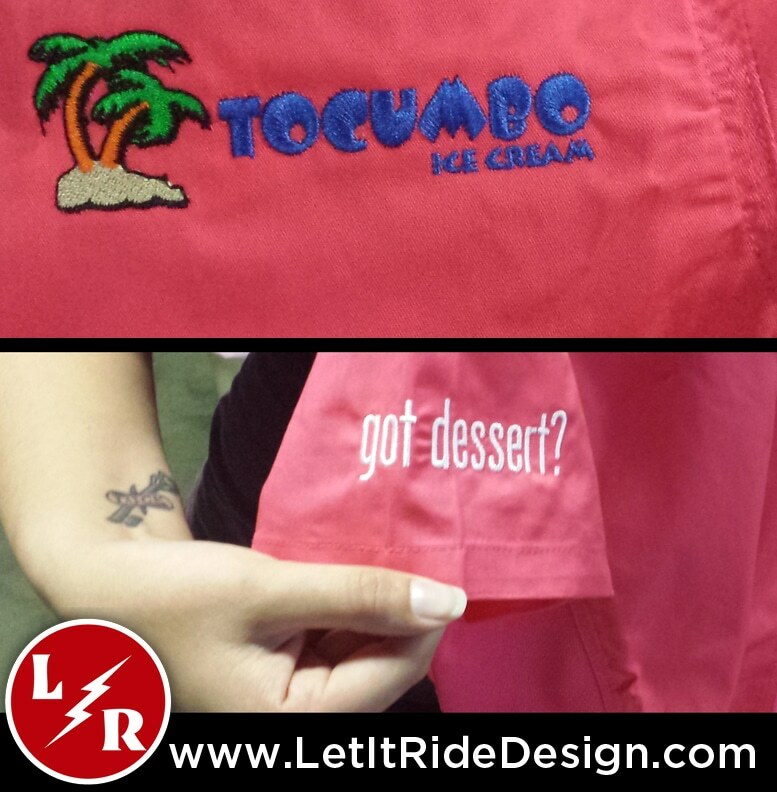 One of our newer clients came in with some shirts he needed to get done for his new ice cream shop location he is opening, Tocumbo Ice Cream. The ice cream itself has that amazing flair, so why should the employees miss out on that? Well now they won’t. Our client brought in some custom button-up shirts and wanted them embroidered with the company logo placed on the front left chest of the shirts as well as “Got Dessert” on the sleeve of the shirts. Girls got pink shirts, while the boys had blue, and they are going to look very refreshed in these. Adding embroidery to garments, hats, bags, etc is a nice way to make your statement or get your company name out there, in a professional way. It looks clean and professional. If you are using a custom logo or custom font, these will need to be digitized. If you don’t have a custom font or logo, you can choose from one of our pre-loaded fonts to save on digitizing fees. If you need something embroidered, send us an email with what you need and we will be happy to send you a free quote.